To Allen and Son for dinner. Chris and I shared the pork and stew plate. 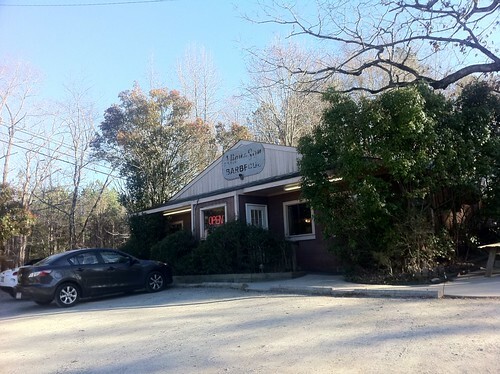 Chris pointed out that the Brunswick stew was more meaty than that at Cooper's Barbecue, but it still tasted mostly of vegetables to me. 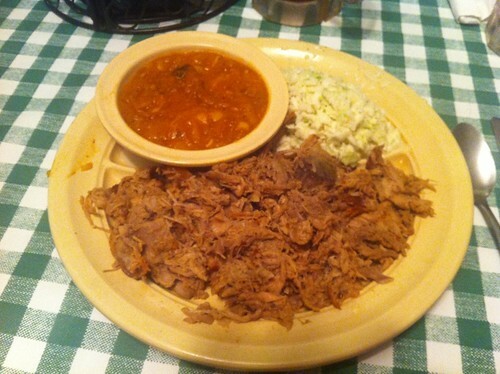 As for the pork... it's possible that I just don't get eastern North Carolina barbecue. I don't recall much smoke flavor in this or any of the barbecue we had. It was all tasty roast pork, but I don't think that I could distinguish it by flavor from the pork knuckle at Bavarian Brathaus. 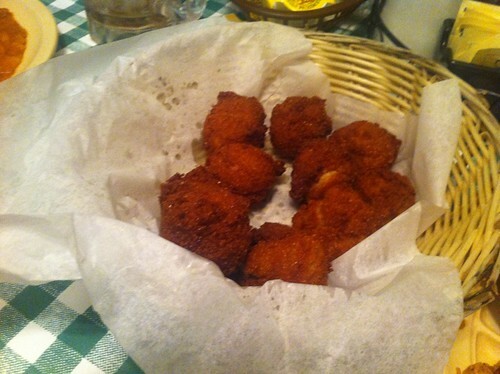 Chris loved the hush puppies; I agree that they were quite good, but they didn't fill me with delight. I was wondering if I was enjoying the day's food less because of sleeping poorly, because I hadn't been delighted by anything so far. But that changed with the dessert course. 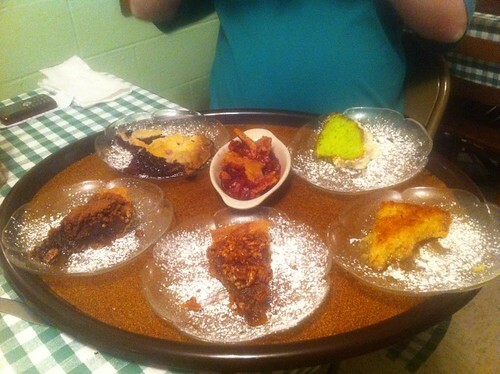 ChiTownDiner imposed organization on the desserts with a clear mandate: "take a bite and pass to the left." 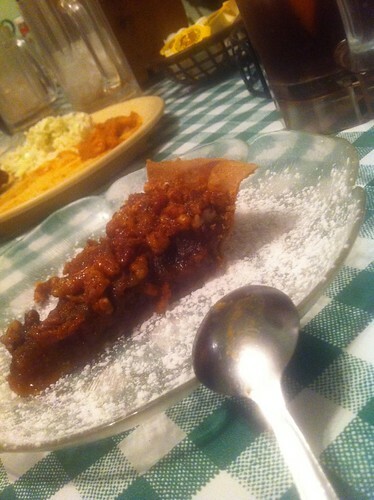 The pecan pie that I ordered was among the most sumptuous pecan pies that I've had. There's always a little fillip of pleasure when I find that my choice really was my favorite of the desserts the group chose, and I got to feel that now. 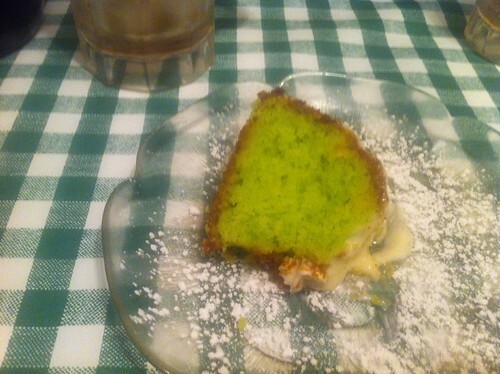 Lori ordered the key lime pound cake. Many of the folks at the table were very impressed by it, but Lori and I didn't notice much about it that improved on what Lori could do in our kitchen with some green food coloring and bottled lime juice. 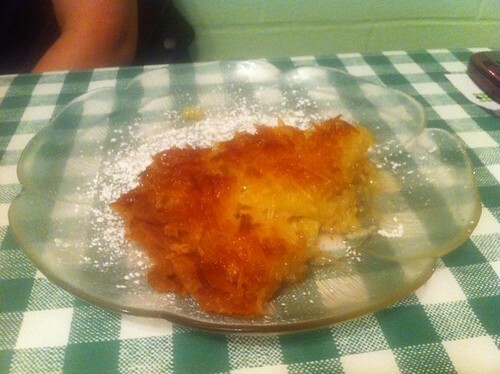 Mariton ordered the coconut chess pie, which was a good chess pie with warm, rich egg and coconut flavors. 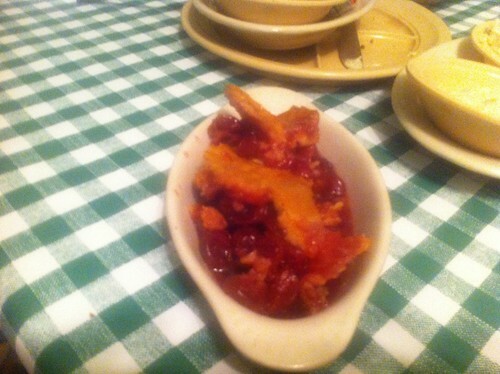 The cherry cobbler was very tasty, but I think it likely that the cherries came from a a can. I also loved the chocolate pie that buffetbuster ordered. 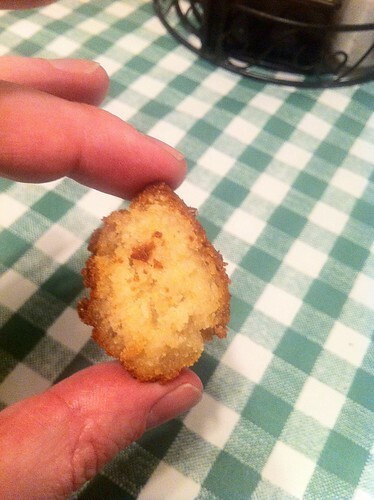 It was very rich and gooshy. Unfortunately, it included pecans which he doesn't care for, and he doesn't care for the coconut in the coconut chess pie, so his quest for pie was still thwarted.